Jetlag getting a little less but had to wake up at 5:45 AM to drive with Dima to the city of Casale Monferrato which is half the distance back to Milano but east toward Torino. It is a small town in the agricultural region of the Po Valley in Piemonte. 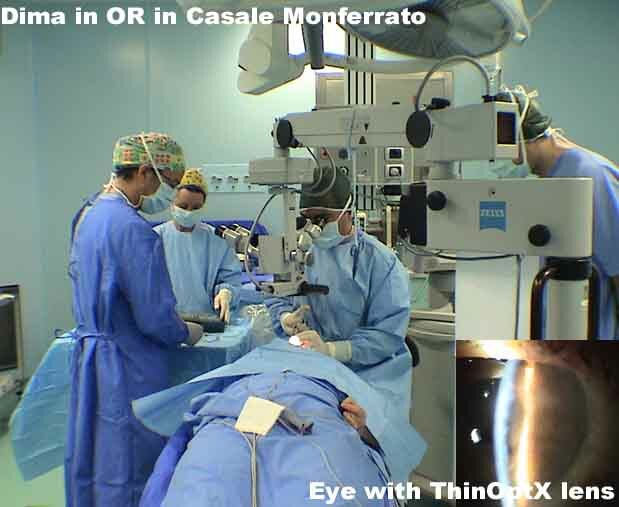 We got to the hospital there (Casa di Cura Sant’Anna) and Dima performed 10 cataract operations, many of them with the new ThinOptX lenses. We had a chance to use the new roller device that worked very well. We even had to implant one in the anterior chamber which has not been done before. The facility was very nice but the hard rubber shoes I had to wear were killing my arches. After surgery I got a chance to do email and send out Diario #1. By 7 PM I changed and did my run through the village center. It is not a particularly interesting city but I saw a tower that was built in 1050 AD which looked new. We then drove back to Zoagli. I again tried the telephone US board meeting and was on for a while but after several attempts, I gave up. We picked up Marcia and then drove down the mountain to a new restaurant, L’acchiappasogni (Lak-kee-op-pah-sohn-yee) where we had assorted meats, veal ravioli with meat sauce followed by a veal & beef grill. It was great. On the way home we drove by to see the special apartments that are built out over the cliffs. Got back to the house and to bed at 2 AM. A very tiring day. I thought I was on vacation. I woke up at 9 AM and declared that my jetlag was finally gone and my cold was over. I actually got out of bed at 11 AM and climbed back down for a swim in the sea. This time Marcia joined us as well as the dog Patrick (Labrador retriever). 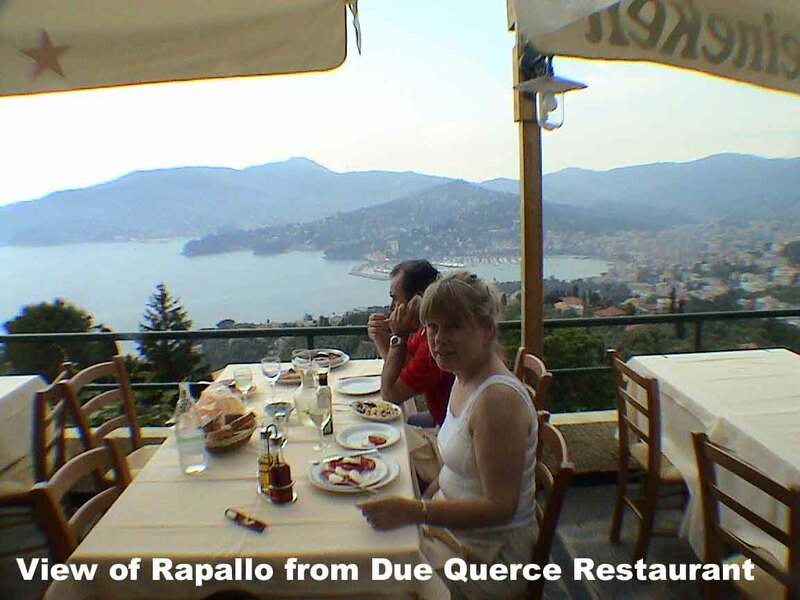 Before Tania went back to Milano so Anastasia could attend school, she told us to be sure to have a meal at this wonderful restaurant in the mountains called Le due Querce in the little town of San Ambrogio. It took some time finding it but when we finally got to the top of the hill, it was certainly worth it. The views were spectacular. 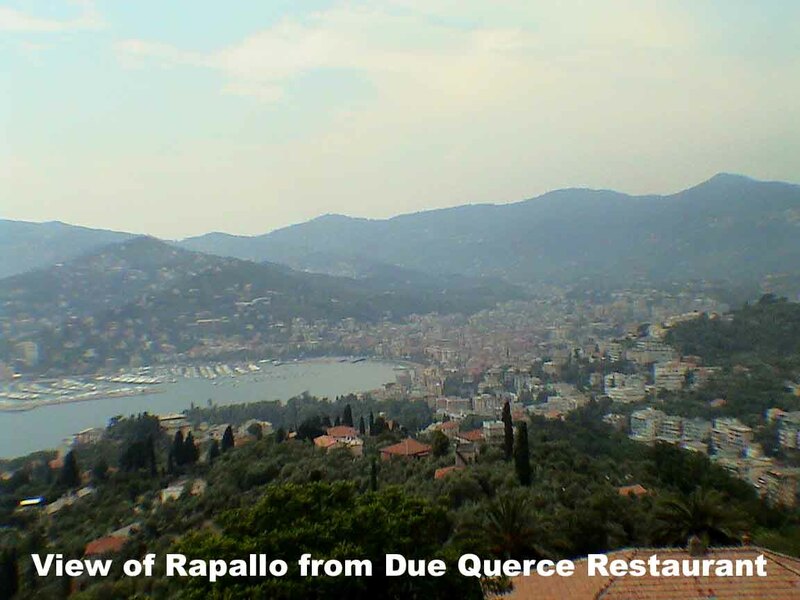 From our table we could see the entire bay including the nearby Rapallo. Further down the coast was Santa Margherita and at the tip was the famous Portofino (meaning "final port"). Not only was the view breathtaking but the food was excellent. I even allowed myself the pleasure of eating lunch like normal people. After visiting the church of San Ambrogio, we drove back to the house and all three of us took a 2 hour nap, something I never do. After we woke, Marcia & I drove to Santa Margherita and I picked up my pantoloni which were ready and I bought another shirt. I did my repeat run and came up with a new idea in the middle of it. Just after changing in a little coffee bar where I met Marcia, Dima pulled up in his car to take us for dinner in Portofino. I gulped my cappuccino and we raced off. Remember that Portofino is really a parking garage which leads ou t to a pretty little picturesque bay surrounded by restaurants. We wended our way to Taverna del Marinaio and there we met our dear friend Giovanni Piovella with his wife and 3 yo daughter, Julia. Julia was having fun with me and it made me really miss Kaylin. We all had a wonderful dinner and a very nice wine called Blangé Cerretto from the Alba region. 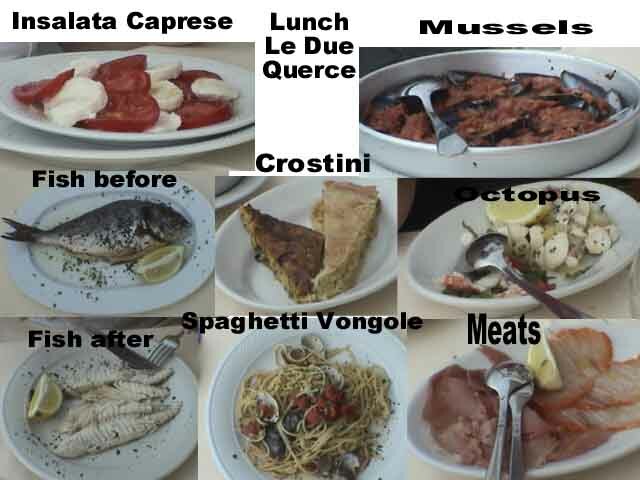 We had gamberi, crostini, mussels, penne con gamberi, sole with butter and a fish called occhione meaning “big eyed fish”. It was all excellent and we had a great time for our last night in Zoagli. Got to bed at 1 AM.